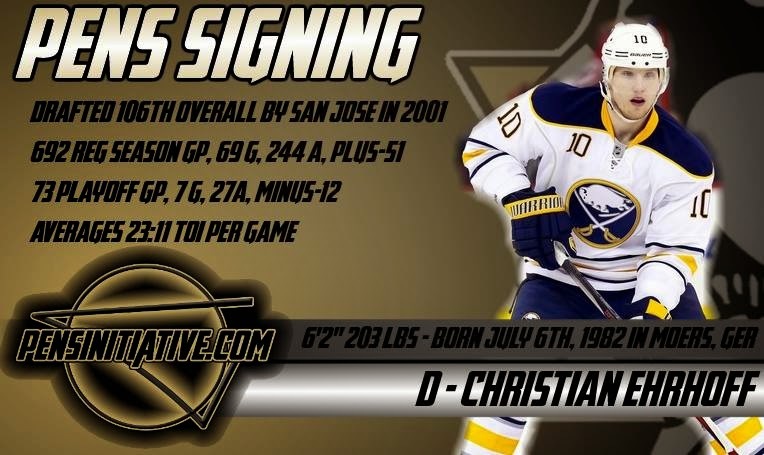 The first shots of free agency have been fired and the Penguins were one of the first shooters signing former Buffalo Sabre Christian Ehrhoff. The 6'2", 196 Ehrhoff joins the Penguins fresh off of a big buyout by the Sabres. The buyout, just three years into a 10 year, $40 million contract, saw Buffalo ridding themselves of a large cap recapture penalty. The deal for the Penguins is much friendlier, standing at one year for $4 million. 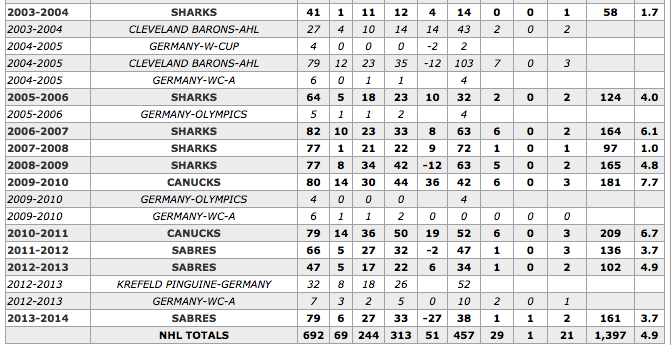 With 692 games played, Ehrhoff stands as an offensive threat and a steadying presence on the blue line. Turning 32 on July 6th, Ehrhoff will add to a steady veteran presence along the blue line and potentially serve as a great mentor to players such as Kris Letang, Olli Maatta, Simon Despres and many other of the young offensive defensemen in the Penguins pipeline. Drafted by the San Jose Sharks in the 4th round of the 2001 NHL Entry Draft, Ehrhoff looks to continue the trend of Jim Rutherford bringing in European players, something his predecessor Ray Shero seemed hesitant to do. The former Sabres captain may also bring some much vaulted leadership and veteran presence to a locker room rumored to be lacking in each. The Moers, Germany native is on his fourth team in his career. He started out in San Jose before playing two years in San Jose then donning the Sabres sweater for his monster contract.